In the meantime, City analysts continue to speculate — and perhaps prepare the ground for some ‘I told you so’ action. Newsflash from Ontario: The Bank of Canada has left interest rates unchanged at today’s policy meeting. Money is also flowing into eurozone government bonds today, on anticipation that the ECB will boost its QE programme. This has driven the yield, or interest rate on German two-year bonds deeper into negative territory – which means the price is at a record high. The pound is tumbling on the FX markets today. It just hit a new seven and a half-month low against the US dollar at $1.4979. The solid US jobs figures, which bolsters predictions that the Fed will hike this month. 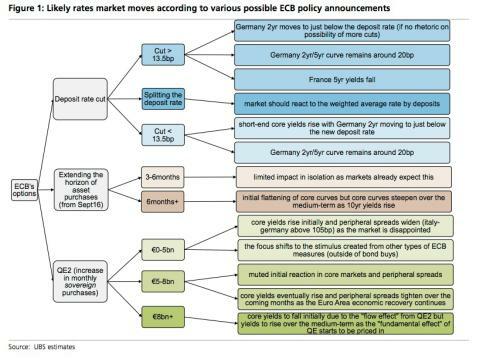 Swiss bank UBS have produced a nifty chart showing the main options which the ECB could deploy tomorrow…..and the likely impact on the markets. A strong dose of US employment data has just increased the chances that the Federal Reserve raises interest rates in two weeks time. A total of 217,000 new jobs were created by US companies last month, according to the ADP Research Institute. 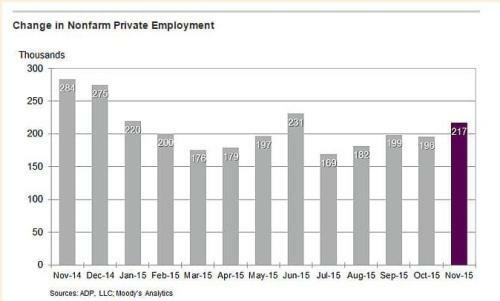 That’s the biggest rise in private sector payrolls since June, and beats forecasts for a 190,000 increase. It also beats October’s reading of 196,000, which was revised up from 182,000. It suggests that the wider Non-Farm Payroll will show a robust labour market. The NFP is due on Friday, and is the last major data point until the Fed’s December meeting. Although the ADP survey has not proved a consistent forecaster of the official monthly government jobs numbers, they may soothe investors nerves ahead of an important period for economic data and central bank decisions. 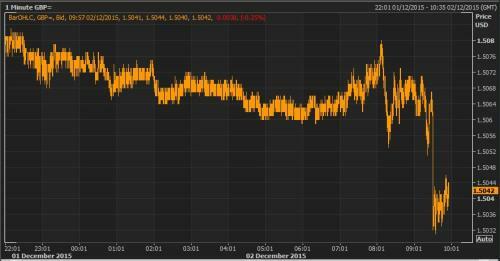 The euro has fallen back today, in another sign that Draghi is expected to announce new stimulus measures tomorrow. The single currency dropped back through the $1.06 mark against the US dollar today, which is a near eight-month low. There’s no realistic chance that eurozone inflation will hit the forecasts drawn up by the ECB’s own economists three months ago. The most recent staff projections from the ECB (published in September) revealed an expectation for HICP [inflation] to average 0.4% y/y over Q4/15 as a whole. Taking into account today’s outturn, this would require the headline rate to rise to at least 0.8% y/y in December in order for those forecasts to still be valid. Suffice to say, we think that is too tall an order, even taking into account the expected base effects from last year’s oil price declines (expected to come into force primarily in December and January). In other words, this outturn should represent further downside news for the ECB. And that’s why del Carpio predicts a further 20 basis point cut to the deposit rate, and a 6-month extension to the QE asset purchase programme . Loynes is also concerned the core inflation – which excludes volatile components such as energy prices – dropped from 1.1% in October to 0.9% in November. Ruben Segura-Cayuela, a euro zone economist at Bank of America Merrill Lynch, believes the weak inflation report will have surprised the European Central Bank, in a bad way. With inflation stuck at just 0.1%, Segura-Cayuela believes the ECB will boost its bond-buying QE programme from the current rate of €60bn per month. “It [the inflation report] is not consistent with the trend that the ECB was expecting. Segura-Cayuela is also in the ‘deeper negative rates’ camp — he reckons the deposit rate on bank deposits at the ECB could fall from -0.2% to -0.3%. EA inflation fails to pick up despite (minor) base effects. Weaker core/service illustrates #ECB problem: recovery too weak to lift prices. 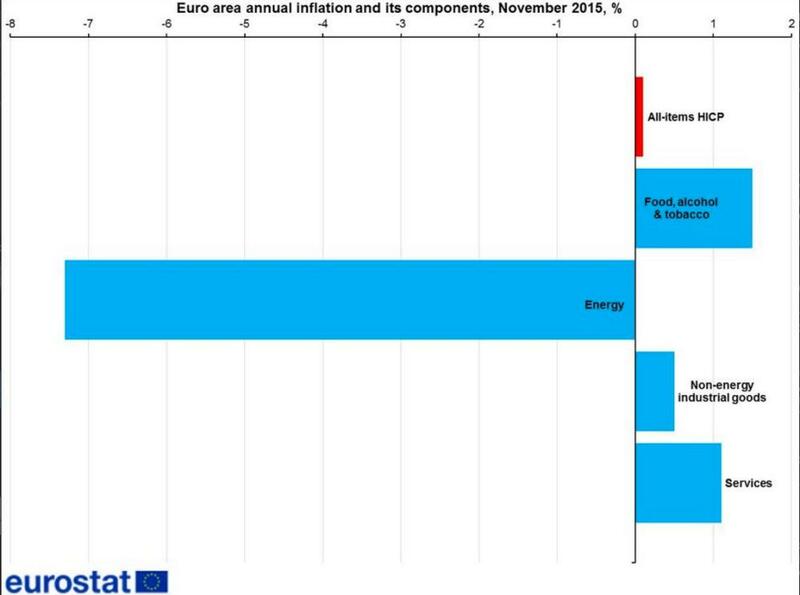 Economist and ECB watcher Fred Ducrozet has found a chart showing how weak inflation will prompt extra QE from the European Central Bank. The x-axis shows the forecast for inflation — the ECB’s target is just below 2%. The y-axis shows how much extra bond-buying would be needed if inflation is falling short — red if the ECB is struggling to push funds into the real economy, and grey if the ‘transmission mechanism’ is working well. And as Fred tweets, today’s poor inflation data suggests anything between €400bn and one trillion euros of extra QE could be required. Citi predicts lots more QE. Citigroup has predicted that Mario Draghi will make two serious announcements tomorrow. 1) They expect him to hit the banks with more severe negative interest rates, by cutting the deposit rate at the ECB to minus 0.4% (compared with minus 0.2% today). 2) In addition, they suspect Draghi will boost the ECB’s bond-buying programme from €60bn per month to €75bn per month…. …and also run the quantitative easing programme for another six months. So rather than ending in September 2016, it would continue to March 2017. That adds up to around €585bn of extra QE, I reckon. The feeling at the desks is that the lower inflation gives Draghi all the ammunition he needs to convince the ECB to go large tomorrow.. He believes Mario Draghi could announce plans to buy more assets with newly printed money each month, rather than just run the quantitative easing programme for longer. 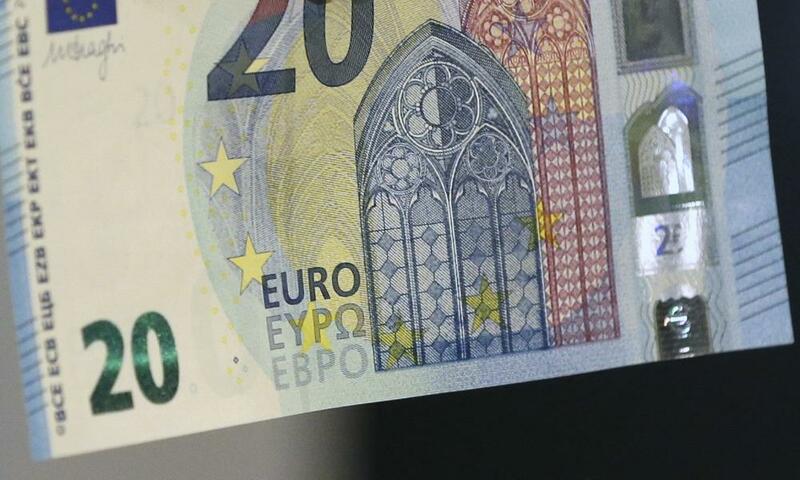 The euro plunged after data showed Eurozone inflation was stuck at a meagre 0.1% year-over-year in November, missing estimates of a slight rise to 0.2%. The inflation miss adds to the case for stronger action from the ECB tomorrow. The data could be the difference-maker for the ECB choosing to increase the size of monthly asset purchases over just extending the end-date of the QE program. Currently the ECB is buying €60bn of assets each month with new money, to expand its balance sheet and push more cash into the economy. Eurozone’s inflation rate was, once again, pegged back by cheaper oil and petrol. Here’s the detail, explaining why inflation was just 0.1% last month. Another blow – core inflation, which excludes energy, food and tobacco, only rose by 0.9%. That’s down from 1.1% a month ago, suggesting that inflationary pressure in the eurozone is actually weakening…. Here comes the eagerly-awaited eurozone inflation data! And it shows that consumer prices only rose by 0.1% year-on-year in November. That’s a little weaker than the 0.2% which economists had expected. Britain’s construction sector is suffering from a lack of skilled builders, warns David Noble, CEO at the Chartered Institute of Procurement & Supply. “Suppliers continued to struggle this month, citing shortages in key materials, supply chain capacity and skilled capability as the causes. 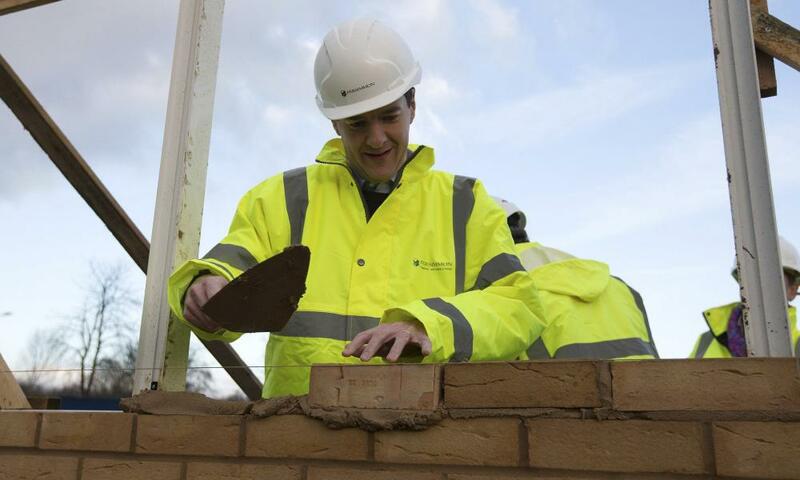 Maybe George Osborne should get back to that building site…. 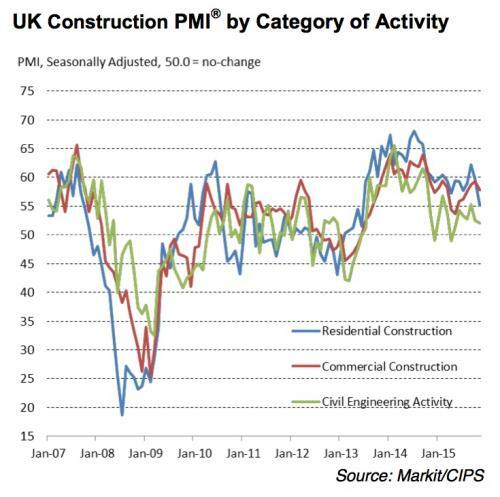 “The UK construction recovery is down but not out, according to November’s survey data. Aside from a pre-election growth slowdown in April, the latest expansion of construction activity was the weakest for almost two-and-a-half years amid a sharp loss of housebuilding momentum. “Residential activity lost its position as the best performing sub-category, but a supportive policy backdrop should help prevent longer-term malaise. Strong growth of commercial construction was maintained in November as positive UK economic conditions acted as a boost to new projects, while civil engineering remained the weakest performer. Breaking — growth across Britain’s construction sector has slowed to a seven month low, as builders suffer an unexpected slowdown. 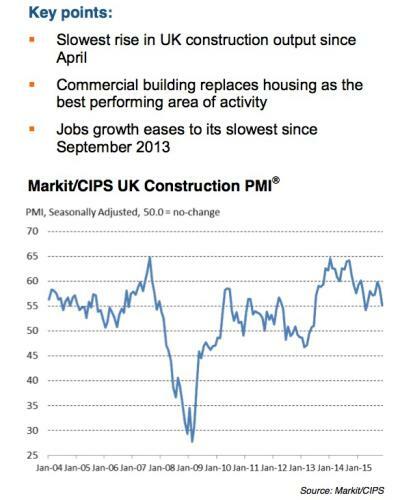 Markit’s Construction PMI, which measures activity across the sector, fell to 55.3 last month from 58.8 in October. That is the weakest reading since the pre-election slowdown in April, and the second-weakest since mid 2013. The slowdown was particularly sharp in the house-building area – which is particularly worrying, given Britain’s desperate need for more homes. All three broad areas of construction activity experienced a slowdown in output growth during November. Residential building activity increased at the weakest pace since June 2013, while civil engineering activity rose at the slowest rate for six months and was the worst performing sub- category. A new survey of Europe’s businesses has found that, for the first time since 2009, they aren’t struggling to get credit. That suggests the ECB’s policy measures are having an effect — and also indicates that perhaps more stimulus isn’t needed after all…. 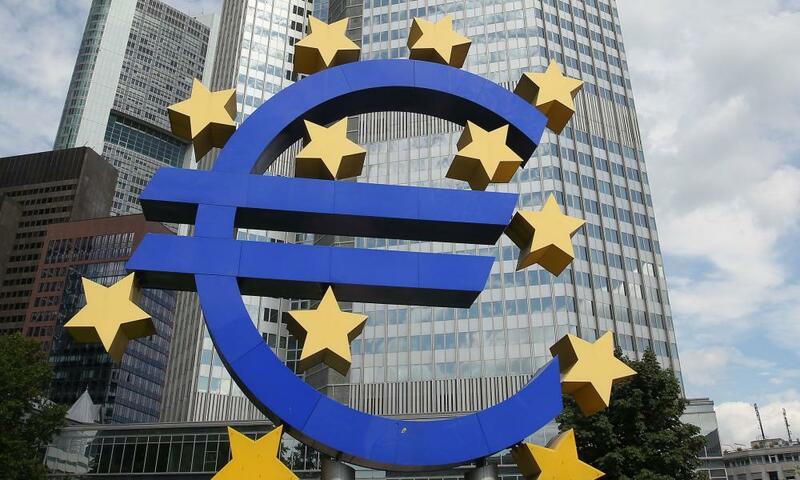 The ECB surveyed more than 11,000 companies across the eurozone. And most reported that they have no concerns over their ability to borrow. Instead, the main problem is a lack of customers. It’s six weeks since the last ECB meeting, when Mario Draghi dropped a loud hint that the central bank was ready to do more stimulus if needed. Since then, European stock markets have climbed steadily, and are heading for a three-month high today. Latvia’s central bank governor has apparently told a local newspaper that the ECB’s quantitative easing programme is “better than doing nothing”. That’s via Bloomberg. The interview took place with the Neatkariga Rita Avize newspaper – but there’s only a teaser online. There’s a bit of edginess in the markets this morning, as investors wait for November’s eurozone inflation data to arrive in 70 minutes time. Economists expect a small uptick, from 0.1% to 0.2% — while core inflation (which strips out volatile factors like energy and food) might hover around 1.1%. Given that the region’s failure to reach its inflation targets is one of the main reasons the Eurozone’s central bank is considering another injection of QE, this Wednesday’s figures perhaps carry slightly more weight than they have of late. This chart shows how investors expect the ECB to impose deeper negative interest rates on commercial banks. It’s possible that the European Central Bank disappoints the markets tomorrow. 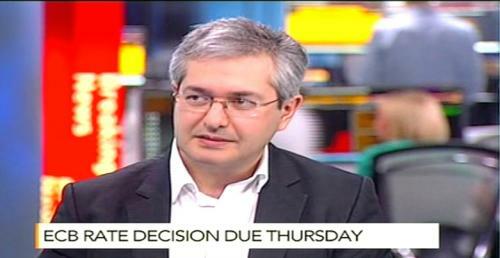 Ramin Nakisa, global asset allocation manager at UBS, believes the ECB will not boost its quantitative easing programme tomorrow, despite a general belief that more QE is coming. He also reckons the deposit rate paid by banks who leave cash at the ECB will only be cut by 10 basis points, from minus 0.2% to minus 0.3%. If that happens, there could be some disappointment in the markets. But in the long-term, Nakisa adds, the eurozone economy is recovering. More stimulus isn’t really needed. Ding ding – European markets are open for trading, and shares are rising. The German DAX, French CAC, Italian FTSE MIB and Spanish IBEX are all up around 0.4%, ahead of tomorrow’s ECB meeting. The FTSE 100 is lagging, though – up just 0.1%. It’s being dragged down by Saga, the travel and insurance group, which has shed 5% after its biggest shareholder sold a 13% stake. You’d think that printing banknotes would be a safely lucrative business (losing money? Just make some more!). But De La Rue, the UK-based printer, has just announced that it’s cutting around 300 staff and halving its production lines from eight to four. The axe is falling sharply on its Malta plant, which is to close. 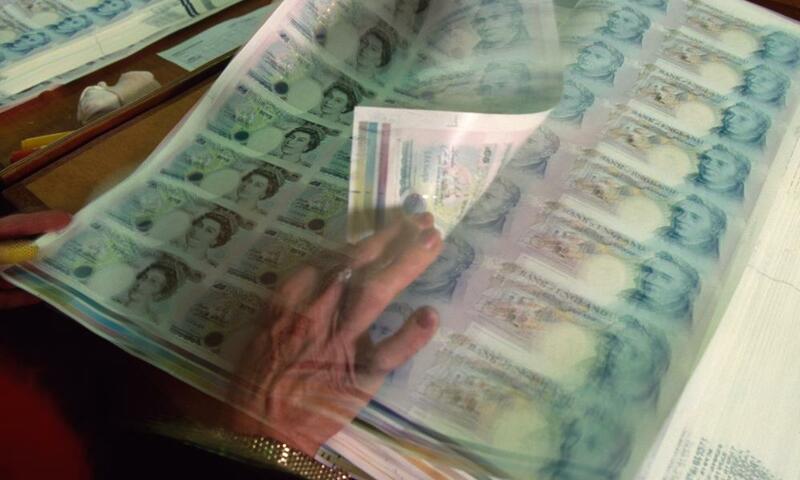 De La Rue prints more than 150 national currencies, and has suffered from falling demand for paper notes. There had been chatter that it might pick up the contract to produce new drachma for Greece, but that particular opportunity appears to have gone….. There could be ructions in Wolfsberg his morning, as the billionaire owners of Volkswagen face workers for the first time since the emissions cheating scandal broke. The Porsche-Piech have been criticised for keeping a low profile since the VW crisis erupted. But today, several members of the group will make the trip to the carmakers headquarters to show solidarity with workers – who are being forced to down tools over Christmas because sales have weakened. Wolfgang Porsche, chairman of family-owned majority shareholder Porsche Automobil Holding SE, will address thousands of workers in hall 11 of Volkswagen’s huge factory in Wolfsburg, Germany. He’ll be flanked at the 9:30 a.m. staff meeting by the other three supervisory board members who represent the reclusive clan: Louise Kiesling, Hans-Michel Piech and Ferdinand Oliver Porsche. The Porsche-Piech family has been asked by labor leaders to signal their commitment to workers, now facing two weeks of forced leave during the Christmas holidays as the crisis begins to affect sales. Labor chief Bernd Osterloh, who has pushed to shield workers by focusing cutbacks on Volkswagen’s model portfolio, will host the assembly. It comes amid mixed news for Volkswagen: though the company has made progress toward a simpler-than-expected recall of 8.5 million rigged diesel cars in Europe, plummeting U.S. sales show the impact of the crisis on the showroom floor. There’s a ‘calm before the storm’ feeling in the markets today. Investors are bracing for Thursday’s European Central Bank meeting, where it is widely expected to boost its stimulus programme. European stock markets are tipped to rally at the open, on anticipation that Mario Draghi will step up to the plate again and announce something significant. It could be a new cut to borrowing costs, hitting banks with harsher negative interest rates to force them to lend money. Or it could be an extension to the ECB’s QE programme – a commitment to pump even more new electronic money into the economy. Or something else entirely. With ‘Super Mario’, you never know for sure. The ECB is under pressure to act, because inflation in the eurozone is so weak. At 10am GMT, the latest eurozone prices data is released — it’s expected to show that prices rose by just 0.2% annually in November. That would be an improvement on October’s 0.1%, but still far short of the target (just below 2%). The latest measure of US private sector employment is released at 1.30pm GMT. That will give a clue to how many jobs were created across America last month, ahead of Friday’s non-farm payroll report. Federal Reserve chair Janet Yellen is speaking at the Economics Club of Washington on Wednesday at 5:25pm GMT. And Canada’s central bank sets interest rates at 3pm GMT – we’re expecting no change.